Share the post "Grow Your Own Ginger Indoors"
Are you a ginger fan, who knows all health benefits of ginger (read here if you want to refresh it in your memory)? Do you like to grow plants indoors? Then this post is for you! Did you know that ginger is the perfect plant to grow indoors? 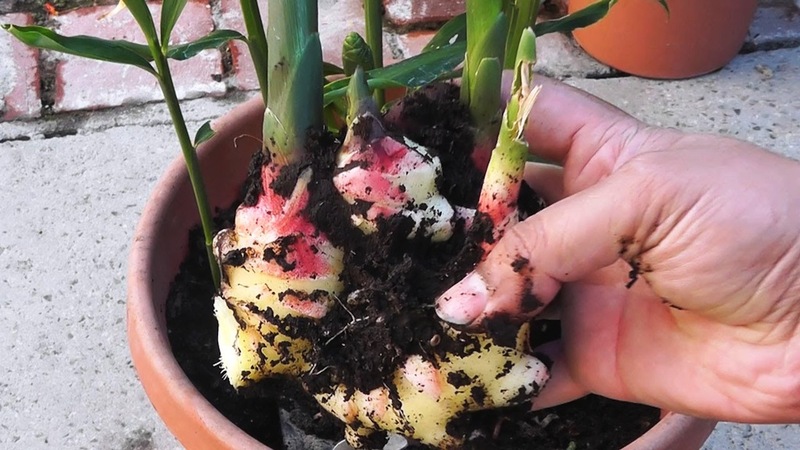 It’s quite easy, as this plant is very low-maintenance, loves partial sunlight, and what’s even better, you can use parts of the ginger root at a time, leaving the rest in the soil to continue growing. Actually, growing ginger looks a bit like bamboo, and has striking flowers, if you can get it to bloom 🙂 So, ginger can make a beautiful addition to your house. Ginger is not much different from other plants and requires the same things other plants do. To get started the first thing you need is the ginger root, known as rhizomes. Make sure you buy fresh roots, the best would be to get them from someone who grows ginger or buy it from a local nursery or a garden center. You can try and grow grocery store ginger but it not really recommended, as it can be sprayed with a growth inhibitor, which keeps it from sprouting or even worse, grocery store ginger could be coated in pesticides and fungicides. You never know! But if you decide to try, first of all before planting, soak the root in water overnight to remove as much bad things as you can. But even if you have bought your ginger at the nursery, soak it anyway in warm water for 12 hours before planting. Usually plump and smooth skinned ginger root is best. It should have several eye buds on it (just like potato eyes). If your root has several eye buds, you can cut it and place each bud in a separate pot to grow several plants. Now, you need a pot or a container for your plant. Ginger prefers shallow and wide pots, as its roots grow horizontally. Make sure the pot has adequate drainage to drain away water and waste. Fill your container with very rich but well draining potting soil or a mix of potting soil and sand. Cut the soaked ginger root into smaller pieces and place them with the eye bud pointing up in the soil. Cover the root with 1-2 inches of soil. Water it well. Put your container with the ginger on East or South facing windows, or in any spot that stays reasonably warm and doesn’t get too much bright sunlight. Keep the soil moist (add water daily or alternate days). Proper draining is important to avoid rotting. A warm environment is also essential. Ginger requires constant 75 F (24 C). Ginger plant cannot stand strong winds and direct exposure to the sun. Ginger is a slow grower, after a few weeks, up to one month, you should see it sprouting. Continue to water the plant regularly and keep it warm. When you start to see the shoots you can add a little bit more soil (1-2 inches). Small pieces of ginger can be harvested 3-4 months after growth begins. Pull aside some of the soil at the edges of the pot, find some rhizomes beneath the surface and cut the pieces of ginger off that you want to use, and then return the soil. Little bits of the ginger root can be removed while it continues to grow. Also, whenever you cut the rhizome, you can plant another one to replace it, so it will help to you grow ginger for a long time. Also, you ginger stems can be laid down on the soil (leaves removed), and each leaf node will root and a new plant come up. Care well for your plant, so it will continue to produce roots for your pleasure. Consume ginger in reasonable quantities and stay healthy! Ginger (Zingiber officinale) is a flowering plant, in the family Zingiberaceae (to which also belong turmeric (Curcuma longa), cardamom (Elettaria cardamomum), and galangal) whose rhizome, ginger root or simply ginger, is widely used as a spice or a folk medicine. Although ginger no longer grows wild, it is thought to have originated on the Indian subcontinent. 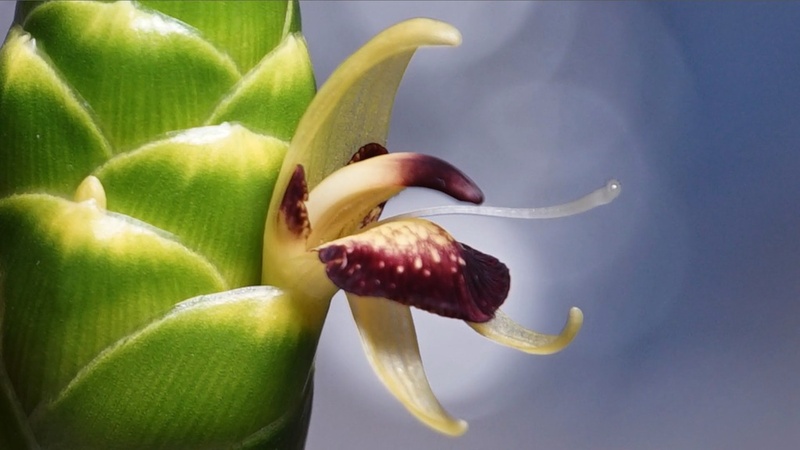 Ever wondered how the real edible ginger flower looks like? Check it out! In the 13th and 14th centuries a pound of ginger was equivalent to the cost of a sheep. When ginger is pickled in sweet vinegar it becomes pink which is often seen in sushi. Ginger is mentioned in the Bible, Koran and the Talmud. Jamaican ginger is considered to be the best of all. Ginger root is probably one of the most commonly used herbs in the world of medicine. You can watch a video here about hot to grow ginger in the pot.